But how do they benchmark what they are doing and how do they seek advice? Typically groups within organisations pursue activities they perceive to be in line with the views of the C-suite. Failing to live up to those perceptions is viewed as failure and this can lead to all kinds of behaviours that seek to avert personal risk at the expense of the organisation’s real goals. We worked with the divisional director and his team to help them devise better ways of tackling change. In the first instance we coached the director in being able to tell his team that failure might be positive and that the measures of performance would reflect honest approaches. His decision-making processes visibly changed as he started to communicate what he was looking for and why. 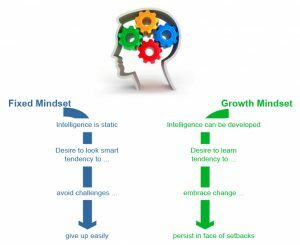 Evidence of a shift towards a Growth Mindset. This widened to mentoring the management layer to adapt their normal behaviours and to value learning opportunities from whatever source. Translating this into a change proposal that was being worked on delivered some interesting and positive outcomes. Suddenly the idea of something being rejected was no longer seen as failure but rather the prevention of wasting resource on the wrong project. Overall a spend of £9m was averted – allowing the resources to be used to better effect on something else. The main board were delighted and it marked a shift in attitudes that could be built on and spread as best practice.